Adam Riley hopes he can keep fellow spinner James Tredwell out of the Kent side after being picked ahead of the experienced England international. The 22-year-old took five wickets in the draw with Leicestershire at Canterbury this week. "It is a new chapter in my career as I have never come in with Treddy around and available for selection," Riley told BBC Radio Kent. "If I take wickets it might be a more extended run than everyone thinks." Tredwell featured regularly for England's one-day side over the winter and was handed an incremental contract by the England & Wales Cricket Board last month. 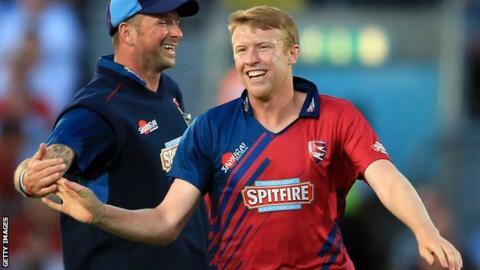 The 32-year-old played in Kent's opening Division Two match of the season, the 125-run defeat by Worcestershire, taking match figures of 3-137. Tredwell, who took 17 Championship wickets at an average of 56.76 last season and resigned the Kent captaincy in December, was replaced by Riley against Leicestershire while he works on his action. "Treddy has gone away to the second team and done some modifications," Riley added. "He was playing lots of one-day cricket over the winter. "Treddy has got his own issues with the game at the moment and we are all fully confident he will bounce back and come back to what he was a couple of years ago. "In the meantime it is a great opportunity for me to show what I can do." Loughborough Uni student Riley took nine wickets in the university's first-class match against Sussex at the start of the month. "I had a good pre-season with Loughborough and Kent, taking a few wickets, so I have been carrying on the work I have been doing there," he said. "I did some technical work during the winter at Loughborough. It is quite a long winter so you have plenty of time to do it. "I was quite happy with the way it went in pre-season, getting overs under my belt." Riley, who made his first-class debut for Kent in 2011, is remaining bullish about his chances of keeping Tredwell out of the Kent side. "I didn't really feel the pressure as I feel quite comfortable in the first team," he said. "Treddy is a great bowler and he did great work for England in the winter but there is no reason why he should walk back in the side if I take wickets. "We get on really well but I need to start moving forward in my career. "I don't think anything is set in stone at the moment. If you get too far ahead of yourself you could come crashing back down to earth. "If I keep taking wickets it is harder for the guys to drop me."